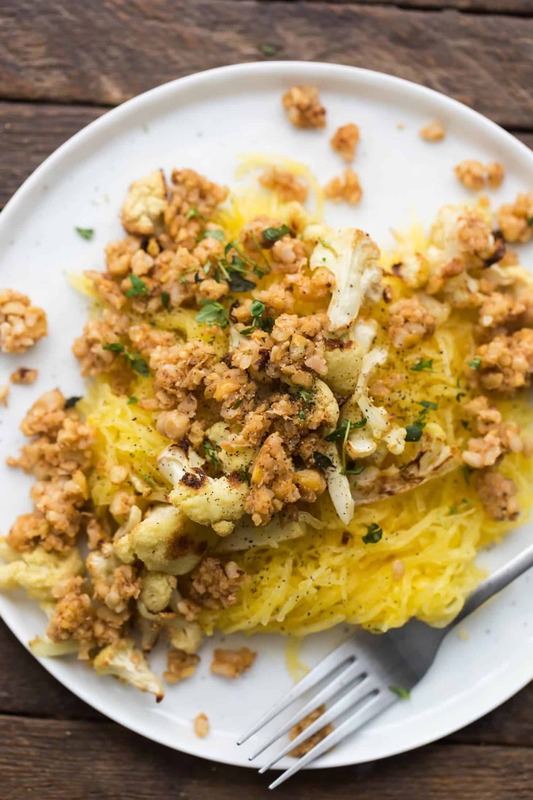 Roasted Spaghetti Squash with Thyme Butter | Naturally. For the longest time, I did not like spaghetti squash. I loved the creaminess of the butternut squash and the earthy flavor of the acorn squash. I had a hard time getting past the stringy texture. Once I got past what it wasn’t, I fell in love with what it was. Roasted Spaghetti squash became a staple as a base for sauces, roasted vegetables, and everything in between. This particular version includes one of my favorite recipes- the crumble. It’s a mixture of brown rice, chickpeas, and pecans that I’ve found to be the perfect topping for salads, potatoes, and as one reader commented, stuffed cabbage. I typically make a larger batch than the recipe calls for to use throughout the week. Preheat oven to 400˚ F. Cut the spaghetti squash in half and place cut side down in a roasting pan. Add about 1/2″ of water to the pan and place in oven. Bake until squash is tender, 45 to 60 minutes. Combine cauliflower with olive oil, salt, and pepper. Place in a roasting pan or on a sheet tray. Roast until squash is browning, 25 to 30 minutes (do this along with the roasting squash). While the squash and cauliflower is roasting, In a food processor, combine chickpeas, cooked brown rice, pecans, smoked paprika, and garlic powder. Pulse a few times until mixture comes together and resembles a coarsely ground meal. Heat a skillet over medium low heat and add mixture to pan (if using a pan that sticks, add a little olive oil). Stirring occasionally, heat mixture until fragrant, 4-6 minutes. Once the squash is done and just cool enough to handle, but still warm, scrape the insides with a fork. Place squash in a bowl and add the melted butter and time. Toss until the squash is well coated. Top with roasted cauliflower and crumble. Taste and add salt/pepper as desired. I use the three components of this recipe separately all the time but this was a recipe worth sharing when used together. If you were in a hurry, you could microwave the spaghetti squash (I’ve not done this, but it’s a way to speed up the process). You could also steam the cauliflower but I will always choose roasted cauliflower. Vegan: Toss the spaghetti squash with olive oil or vegan butter instead of the butter. This recipe can easily be vegan. Sauce: This isn’t an saucy recipe as the butter just coats the spaghetti squash. If you’re looking for something with sauce, use a prepared tomato sauce- it works well with the recipe as written. Or, you could even leave out the roasted cauliflower. I’ve tried spaghetti squash a couple times, but I haven’t been able to get over the stringy texture yet! Perhaps I’ll try again though. That pecan crumble looks like it could do the trick! This looks delish! 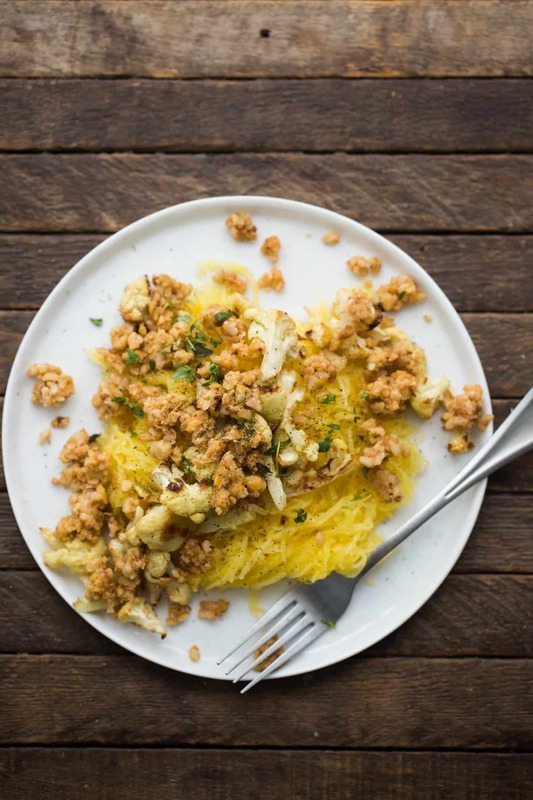 I’m all over spaghetti squash in any form but with a pecan crumble, omg, YES! Erin, this looks SO yummy! 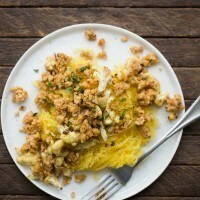 What a wonderful idea for spaghetti squash, I can’t wait to try! This looks like such a delicious, comforting dish! This sounds absolutely gorgeous- thyme butter- yes!! hmmmm tried it tonight. the crumble ended up like a paste…. not yummy. ate the cauliflower and saved the spaghetti squash for something else. what went wrong with the crumble? It really only needs a 3 to 4 pulses in the food processor- my guess is that it spent too much time in the food processor. It also helps to make sure the rice doesn’t have a lot of excess moisture. 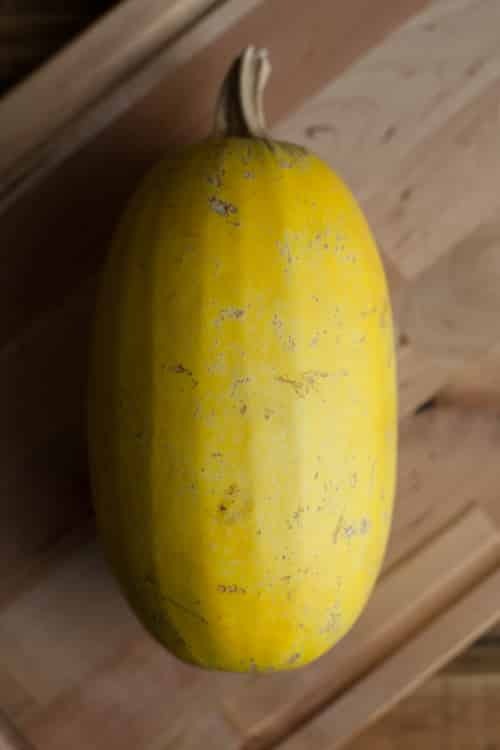 The first time I encountered spaghetti squash I was so baffled, but it was love at first bite. So yummy! I usually have it with a lentil bolognese but I can’t wait to try it with this pecan crumble.